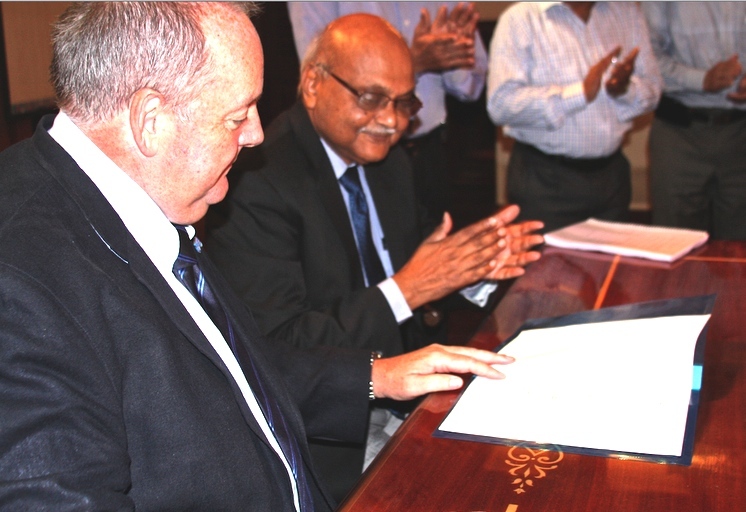 Monday 5 October 2015, Mumbai, India – The Indian Government has now signed the membership of SKA Organisation, bringing India formally into the Square Kilometre Array (SKA) project after years of involvement in its design, and ahead of negotiations to create the inter-governmental organisation that will construct and run the telescope. Prof Phillip Diamond (Director General, SKA) and Dr R.K.Sinha (Secretary, DAE, Govt. of India) at the signature of the membership of SKA Organisation. The secretary of the Indian Department of Atomic Energy (DAE), Dr. R.K.Sinha signed the documents on behalf of the Government of India in a ceremony in Mumbai on Monday, 5th October 2015, in the presence of Professor Philip Diamond, Director General of the SKA Project. The event was attended by dignitaries from SKA Organisation in the UK, scientists and officials from the DAE (and DST) and scientists from various research organisations in India, who are contributing to the project. The National Centre for Radio Astrophysics (NCRA-TIFR) in Pune is identified to be the nodal institute for overseeing SKA related activities within India. NCRA first joined SKA Organisation in April 2012 as an Associate Member and became a Full Member in August 2014. It has been involved in the SKA project since the project’s earliest days and was one of the institutions that signed an agreement in 1997 to develop technologies for a large-scale radio telescope. “Several Indian scientists are working on research areas relevant to the SKA, and are gearing up for doing cutting edge science with the instrument when it is ready”, said Professor Swarna Kanti Ghosh, Centre Director of the NCRA. See the full press release from NCRA here.